* Always acknowledge those who work hard for the Lord, who care for us and correct us. Hold them in highest regard with love. * Live in peace with each other, warning those who are disruptive and idle. * Encourage those who are down and depressed. * Be patient with everyone. * Always strive to do what is good for others. *Give thanks in all circumstances. 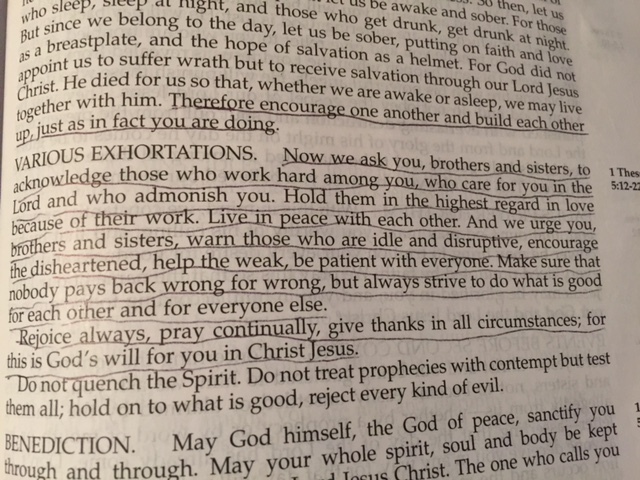 Thank you, dear Father, for this reminder of how we should treat our brothers and sisters in Christ.